I just heard you’re supposed to fill this page out. Oops. Unfortunately that’s kinda how I travel sometimes too, clueless until the end. (Like the time I didn’t know it was a national holiday in Ecuador, so ended up sleeping in some lady’s laundry room). That hasn’t stopped me from visiting 40-something countries (so far) and loving something about every one of them. After 10 stationary years acting like I was a grown-up (my closet was wall to wall with poorly fitting bland button-up shirts) I got rid of the car, phone, job (and shirts) and bought a one-way ticket to Europe. I had a two month wander in mind, but it ended up taking nine. My “travel baby” was born. The stationary life fit even worse than the shirts after that, so I got a TESOL certificate to teach English (and an openness for whatever miscellaneous employment opportunities appear), and a series of one-way tickets. That was four years ago and I can’t seem to stop, or want to. I do pause periodically, most recently to live in Belgium for a year and a half with my lovely Belgian lass, who is also the only person I can imagine spending three months on sweaty chicken buses with without trying to kill. “Had a pygmy marmoset riding around on my neck” for example. Update: Just before 60 countries, I realized I actually was traveling to run from something. What a colossal disappointment! So I’ve changed my life, picked a place to live, and am limiting travel to finite trips with round-trip tickets purchased in advance. It ain’t easy, but I’m pretty sure it’s worthwhile. We’ll see if I can cut it. Thanks Maddie, I hope you can enjoy some vicarious pleasure, just as I did from your Niagara Falls post. One of these years I’ll see America. And I particularly liked your post about Valentine’s Day. Who knew Twilight was popular in quite that way? Thanks for visiting my blog. Yours is a real beautiful one. Wish you a colorful journey ahead! Will keep on visiting to hear about new experiences. Thanks! It is indeed a colorful life, from the white of ancient marble this morning to the red of squished mosquitoes tonight. Salud! Love your writing style and envy the way you’ve created a life for yourself that permits such freedom of movement! I travel as much as possible, though I also love my own city, and I’m (hopefully) piecing together some life skills that will allow me to live in a similar way 🙂 Good on you for setting such a great example for me to follow! Setting a good whatnow? Right now I feel like the one thing I can demonstrate well is killing Turkish mosquitoes, though to be fair, they seem to be slower than most of their relatives. The lifestyle certainly has its ups and downs, as do they all, but I highly encourage you to try it if it calls to you. I will always be glad for any tips/wisdom for it that you have, here if you need to divulge, and interested to hear if you ever find the reason why all lists must be three items long. Thank you for visiting American Male hope you come back and visit soon! You too! I’m glad I’m getting to read some of your fiction. But of course the question is how much is based on real stuff..? Thanks for stopping by and liking my blog. We are fellow travellers at heart. Absolutely! I look forward to reading more about your return to the Pantanal. i’m now a fan of how you tell your stories. it’s the same style that i try to use in writing about my travels. most of the travel blogs that i come across with almost always sound like a guidebook. there’s nothing wrong with it, don’t get me wrong 🙂 but the personal experiences/stories are the stuff that keeps me glued. Thanks for the recent visit to (and follow of) my blog–much appreciated. It had the happy consequence of bringing me here, and I’ve enjoyed perusing the entries. I’ve enjoyed the stories and the irreverent style in which they’re told. I’m very glad to hear that, serendipity on all sides! I find life much too important to take seriously, so I’m glad irreverence is a good thing for you! Sounds like my kind of travel philosophy! I’m going to sit down soon and look at your travels through Myanmar. It’s working for me fairly well (although at the moment I am counting Malaysian ringgits to see if I have enough for food to stay one more day on this ATM-less island) but I definitely respect y’all who travel with kids, that is much more work! I hope you enjoy the Myanmar posts! Nevertheless your pictures amuse me…want me to tracker more and bring sunshine. (I actually thought I responded to the first one, but apparently the hostel internet went out before it posted.) I’ve always secretly coveted one of those awards, so thank you very much for sending one (and now two!) my way. I’m not sure if I’ll pass it on…let me think about that for a bit…but I really appreciate your including me in it! I have left my nominees burden free to accept or pass it on…so if you choose not to…….no worries :). That’s the good and maddening news, there are far more amazing and worthwhile places to go than a person could ever go in one lifetime. But it sure is fun to see as many as possible! Is there a particular region you’re interested in? I’m most interested in Western Europe. I would love to go to Spain especially, as well as Italy. But like you said, there are endless places to visit! You’re not helping my itchy feet! Yes, I think I’ve had a case of the travel bug, and there is an endless list in my head of places I’d like to go! Spain would be great because I could practice speaking the Spanish language with native speakers. Couchsurfing sounds like a cool idea, and a much less expensive route. Go for it! I look forward to reading about your aventuras! Thanks for visiting my blog. Please come back, again. BTW– I think yours is pretty cool. My pleasure, and glad you like it. Thank you Herr November! It looks like you’ve had some good ones of your own! How about we both keep it up? 😉 Saludos from El Salvador! Haha thank you! El Salvador… come on… I’m jealous as hell! Anyway, I’m looking forward to your next post! What a fantastic blog! I came for your Havana post but I think I’ll stick around and see where you go next. Extremely jealous of your lifestyle, currently sat in writing a report for uni in rainy Manchester, UK, looking forward to your next post! Thank you! I’m glad you’re sticking around, I’ll keep looking for things to show you. And to be honest: uni, Manchester, and even the rain all sound pretty good to me, so the jealousy flows both ways! Ah, you are living the life I aspire to! I feel myself moving in this direction (for the second time!) and my heart begins beating in that old familiar pattern I know so well… meanwhile I get to do it vicariously with you! thank you for making this blog! That’s an exciting feeling, when life starts pulling in a given direction. I wish you all the best of luck with it! My life seems to be moving towards a steadier balance between movement and remaining stationary, but I’ll do my best to keep finding things to talk about for you, and I look forward to reading your tales too! Yes, very exciting, even the ‘unknown variables’. Thank you for the well wishes. I suppose that day will come when the needle doesn’t swing so far to one extreme and I too will seek a certain type of balance which still incorporates all my great loves in life. I’ll stay the course and keep reading your tales for additional motivation! thank you. Wow! What an adventure. A great blog you have here. Great intro! 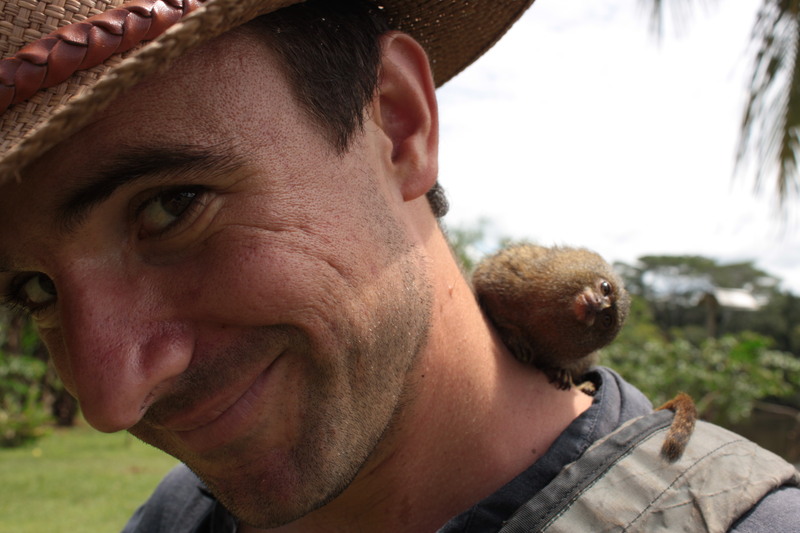 But my favourite….has to be the cute little animal (pygmy marmoset) on your shoulder! How adorable! Thanks for popping over to my blog – it’s much appreciated. Thanks for popping over to mine, we’ll have to continue this inter-bloggal popping. Yes, I would love to see more posts, especially ones which involve cute little animals. No worries, I would probably win if we were in a ‘long rambling essay posts’ competition. I am a ramble pro! I’m surprised people actually read my posts. Haha! There is something horribly narcissistic about many blogs, lots of sentences about I I I and I, but hopefully some of it’s worth reading. Yes,not so cute. Not sure you’ll get me in a jungle! I have a massive phobia of all things creepy crawly. You’re right – blogging can be narcissistic. I see a lot of ‘I I I’ and ‘me me me’. I might be a little bit guilty of this, too! Although, I try to stay mindful of my readers. It’s hard to keep that balance. I live nomadically for 7 years of my life – travel is so enriching as you have discovered. What country did you enjoy most? 7 years a nomad, that’s impressive! I miss that lifestyle, even as I prepare to sign a year lease for the first time since 2004. It’s impossible for me to pick a single most enjoyable country…it tends to be whatever country I’m currently in! Or, if the weather/lines/bureaucracy/illness are bad, then the current country may be the worst ever…hard to tell! What about you? Favorite place(s)? Yeah the bureaucracy can kill the memories of a country trying to get visas etc. Mongolia for its expansiveness, Japan for its people and culture, California for being California. Oooh, Mongolia’s on my list, for sure. Japan too. And glad to see California made it on there. Good list! What an amazing blog! such a wealth of adventures, and beautifully recorded. Thanks for providing some inspiration! Such kind words, thank you! Hi! So happy I just came over your blog! It is really great! Love it! Just what I was looking for. Blog-posts about travelling with deeper meaning! You now have one more follower. I am looking forward to see more! Excellent, thank you for that, it made me feel good to read. Oy, I gotta go move my laundry (thanks for reminding me) and then get lunch, then I look forward to perusing your posts too! Why thank you! I tend to view those awards with a mix of cynicism and jealousy, but given that you’ve been reading my posts for awhile now, and that I enjoy your blog too, I definitely take that as a compliment. Thank you. Great blog, thank you for stopping at mine; Caracas, lived there, saw it with child eyes. Thank you for reading, and my pleasure for doing the same. Impossible to know for sure I guess, but do you feel like all cities are the same for a child’s perception, or perhaps the particulars are all the more salient to a child’s all-observant eyes? Undoubtedly. A child’s perspective is rather obsequious and endearing. I’m glad I found your blog. Such a fresh and unique perspective on travel blogging. You’re living the life, and I wish for you only more of the same. Greetings from India! Thanks for liking my post. Just starting out in this blogging world and was getting a but daunted by it all but seeing your blog has made me understand that I need to give it time. I hope that through my stories I can help others too as you have through yours. Any pointers you have would be great!! Look forward to reading more old your new and old post. Looks to me like you’re off to a great start! I was going to say that people supposedly LOVE Top 10 type posts, but it looks like you already knew that. I have nothing left to teach you, grasshopper. I loved your post about Devil’s Pool, your visit giving grounds to the local legend. I wonder if I can find a place like that around here for a post. Thank you, sensei. Keep on trekking, hope all is well on your side of the world! It’s a delightful and eminently tolerable blend of difficult and fantastic, lately. And another trek coming closer by the week… Hope all’s well in your neck of the woods too! Hello, I a ma journalist for a travel show Echappées Belles, and saw a few articles that could interest us concerning Ecuador. We are currently preparing a shoot there and would love to benefit and share some of the interesting people you’ve met on your travels. Could we chat by email? thank you! Happy travels! Do you often publish guest postings? I haven’t, actually, but I’m not opposed to it. Feel free to email me if you’d like to propose something. I’m really glad that I stumbled upon your blog today. I’m enjoying reading the posts that you’ve already written and look forward to reading more of them in the future. Thank you, very glad you enjoy it, and I look forward to both writing more and reading your blog as well. I still haven’t made it to Batanes, but still hope to. Someday! Hope your travels have been happy and full of learning! Yes, it has been a good year for me. I hope you had the same. Thanks for stopping by! Great photos, destinations, and writing! Thank you for the follow. Love your site, it’s really Awesome! Vaya Con Dios. I love reading your blog! When I come back in a different life I will be YOU. Haha. Sorry, I’ve followed several blogs in the past few months and I’m now just catching up to see who’s who. Keep doing what you’re doing, it’s great. More than great. Have fun and be careful out there. hahahaha That’s quite a compliment! I’ll admit, I’ve got it incredibly good. Not monochrome that way, but so very much to be grateful for. I hope your life is filled with an abundance of joy and gratitude as well! Happy travels! Oh lord, this ancient “about” page is an embarrassment! I need to write a new one! Ah, what I was running from…is a long story. Might need a few blogs to tell it. 😉 Thank you for reading, and for reminding me about this page! Ha! Would be a great post, I’m sure. It’s a great about page, but I know the feeling… mine is ready for a re-do too. Hi, Vagabondurges guy! You mention above “all photos are copyright, but if you would like to use any, I would love to get your email”. I’m sending this to ask about using the one with the grannys racing in their wheelchairs for an educational module I’m making about nursing home quality improvement. Please let me know if this is possible. That’s a dandy of a picture! Hello! I am so sorry for my slow response! And I am terribly embarrassed to admit that I didn’t take the photos in that post and neglected to mention it. (A case of “only my friends read this and they’ll know” I’m afraid.) I can’t even tell you where I got it, since I think it was a google image search pathway. So I am triply sorry, to be so slow, to have failed at crediting it, and at being unable to send you toward whoever can. In addition, I am buoyed by the fact of your asking, that the internet is still a place of kindness and decency, even when I myself didn’t follow the etiquette! Best of luck with the module and I hope it goes/went well!